An artist impression of how St Mary's Lighthouse could look if funding proposals are approved. Major plans to revamp a popular visitor attraction have been rejected over concerns about the impact on wildlife. Proposals had been drawn up by North Tyneside Council to refurbish St Mary’s Lighthouse and expand the facilities on offer for visitors. However, at a planning meeting on Tuesday, the plans were rejected over fears about the effect on seals and birdlife. The plans had been the latest step in the council’s bid to secure £2.1million in Heritage Lottery Funding to progress with the proposals, which may now need to be altered. The proposals included restoration of the lighthouse features and repairing the causeway, plus new features including glass-covered roof top viewing decks, as well as upgrading toilets and educational facilities. But the application drew more than 410 objections and a petition, with the main concerns on the ecological impact of the causeway works and the proposed viewing platforms. 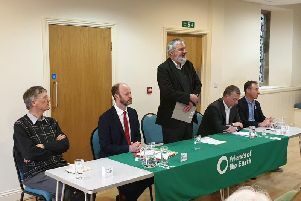 Objections were received from Natural England, the council’s Biodiversity Officer, Northumberland Wildlife Trust, RSPB, St Mary’s Island Seal Watch, with all but the Seal Watch withdrawing their objections to amended plans. Others said “proposal will detract from natural beauty of the area” while the construction work would scare away wildlife who may never return. Campaigners said the open-topped viewing platforms would lead to an increase in disturbance to the wildlife, especially seals that use the island as a haul-out site. They admitted there was overwhelming support for restoring the lighthouse but objectors could not back the proposed roof-top platforms in their current state. Planning officers had recommended the application be approved, but committee members voted five to two against the plans due to the design of the platforms, potential impact on wildlife and concerns over access management plan. Coun Sandra Graham, who voted against the plans, said: “They’ve yet to develop a viewing platform management plan. “They are talking about letting two people on the platform at a time when the visitor centre is open but there is both access from inside and outside the centre. “There are also concerned it will have an impact on the environment. Council officials say they will now working on amending the plans as they look to secure £2.1million from the Heritage Lottery Fund. Development funding of £164,300 was awarded in May 2016 to progress the proposals, with the final bid for the rest of the money already being submitted.